This is a large 4 bedroom, 3 bath vacation pool home in an upscale gated community. This home was a MODEL HOME and has the best location in this community with only one neighbor. VERY PRIVATE pool area that has UNOBSTRUCTED sun on the pool and deck from about 11 am to sunset! It backs up to a beautiful sprinkled lawn, your TENNIS COURT, a large pond where Florida wading birds love to stop, conservation area and a basketball hoop. This home sleeps ten (eight in beds) and is set up with two master suites, perfect for two families traveling together or for the grandparents. The master bathroom has a walk in shower, large soaking tub and walk-in closet. The pool is extra long, 28 feet, and the deck oversized. The home is fully equipped for your vacation pleasure. The owners stay here and fuss over the details of maintenance. 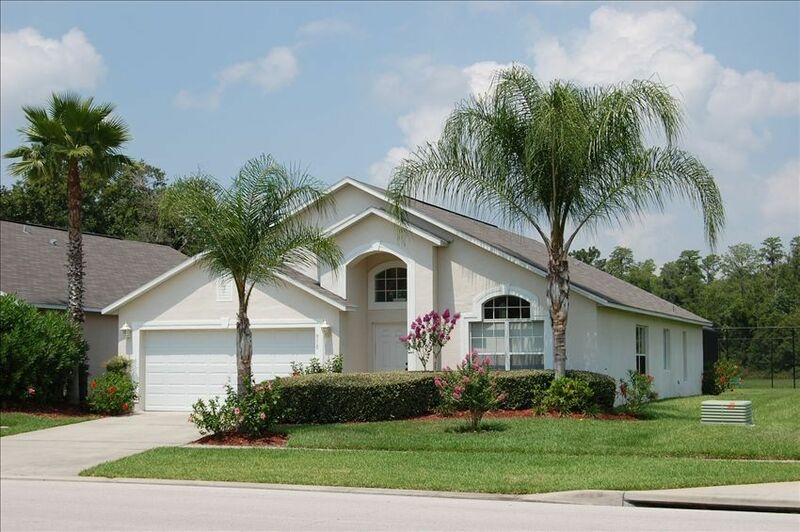 This home is ten minutes from Disney, all the attractions, shopping, golf and dining. You can walk to a Super Wal-Mart. The community has a separate large lake with gazebo, child's play area, barbecue area and fishing (catch and release). FREE INTERNET. Steps to a tennis court, acres of maintained lawn, a large pond with many Florida wading birds and conservation area. Lake Berkley has a new childrens water play area. Very private home with oversize pool (28 foot) and expanded deck area. The stay was good, enough room for our family of 6. Only problem I would have is that the house needs some updating(bedrooms and living area). Everything was close by. Markets and theme park was 5-10 mins away. Will definitely re book them again!! The house is very nice. Nice big kitchen but Not a lot of dishes. Bedrooms were nice but only 2 is tv’s. One in living room and other in master bedroom. Bed was average size but heater was not working when we got there and wasn’t fitted until the day before we left. Didn’t get to swim much, a little cold. Overall, nice house. Overall house was fine, upset I asked for early check in and couldn’t get in, was asked to contact home owner. Couldn’t get ahold of him. the house is ideally located, Sun all afternoon.. unfortunately the pool was not useable as it was constantly being filled with cold water and either the heater was not working or could not keep up with the cold water. That being said we were basically happy …. the furnishings of the house could do with a little bit of updating, such as new bedding the master bed probably should be replaced with a queen bed . I would be more than happy to return.